The Biogel Optifit Orthopaedic surgical glove is ideal to use during rigorous surgical procedures. The Optifit Orthopaedic gloves are roughly 20% thicker than standard latex surgical gloves. 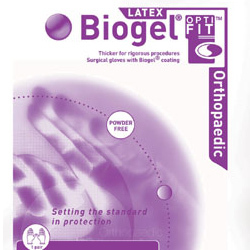 For this reason, the Biogel Optifit Orthopaedic surgical glove is perfect to use during orthopaedic surgeries as the name of the product would suggest. The Optifit Orthopaedic surgical glove has an improved cuff that prevents gloves from slipping. This Biogel Optifit glove can be used in conjunction with a wide variety of disposable gowns including synthetic versions. As with all Biogel surgical gloves, the Optifit Orthopaedic contains an inner coating polymer that allows the gloves to glide over the hands for simple donning.